Essential oils are one of those things, that for a lot of us, just kind of appeared on shelves or our facebook feeds or Pinterest boards… In the past you might have seem them in health food stores, if you had a gluten/nut/dairy allergy before that was a thing (basically any time before 2012), or you might have been familiar with them if you had a particularly crunchy parent or grandparent. Because we’re just being presented with this “new” thing, in so many ways, essential oils might not be something that you’ve considered how they’re sourced: who made them, where they’ve come from, or in our modern world, who’s getting stolen from/taken advantage of, mislead in marketing and other myriad things. The ones you see in Grocery stores, and other big Box Stores, and new rando companies popping up in ads everywhere. Even your favorite tiny local health food store. The system more often than not starts broken, and it’s typically the people who are the most vulnerable: the farmers, growers, harvesters and distillers who bear the burden of these cut corners. Farmers aren’t paid fair prices for their labor and plant matter. Distillers use chemicals to extract more from or extend plant matter. The oil is taken to or shipped to in country brokers who might potentially all have different objectives. The essential oil industry is full of cut corners. The oils can be cut, and extended with fillers that are potentially harmful, or made to smell more like the plant from which it came… or have chemical constituents added to them so chemically it appears as it should on a test. This whole process of cutting and extending starts again when the product is moved to the US or EU. It’s then shipped to every new company popping up, who then bottles and packages it as 100% pure essential oil. There isn’t a regulatory body that supervises this process so, it’s a good luck/fingers crossed situation. dōTERRA removes the middle men. While the temptation for a company as large as doTERRA may be to buy large plots of land and mass produce oils, doTERRA places great value on the expert knowledge of local farmers—many of whom have nurtured essential oil plants for generations. doTERRA recruits their expertise into a Global Botanical Network and, in so doing, responsibly supports thousands of jobs around the world. When doTERRA looks for sourcing partnerships, they deliberately choose locations where they can improve the individual, social, economic, and environmental well-being, while producing the highest quality essential oils. 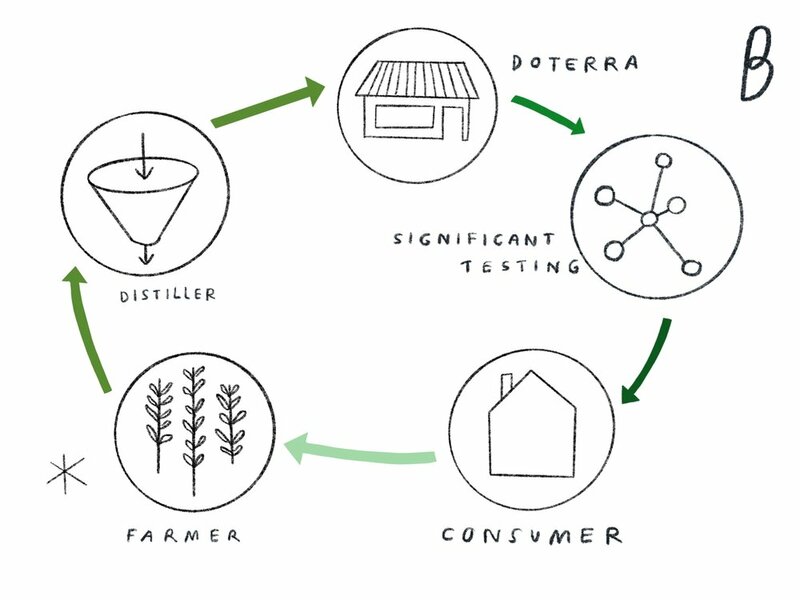 Many of doTERRA’s essential oils grow best in developing countries, and as such doTERRA is in a unique position to build and support ethical supply chains that benefit rural communities in need. Often, experienced essential oil farmers, harvesters, growers, and distillers in underdeveloped areas are paid unfairly or taken advantage of, limiting their ability to escape poverty. Co-Impact Sourcing provides the tools needed to help lift these families and communities out of poverty and promote economic development. doTERRA adheres to additional Sourcing Guiding Principles when working in developing nations. As a consumer of doTERRA essential oils, you are directly impacting these farmers, harvesters, growers, and distillers lives.